James C. “Jim” Roberts, former president of the Virginia State Bar, died Sunday, March 8, 2015. A memorial service will be held at 2 p.m. Wednesday, March 11, at Bliley’s-Central, 3801 Augusta Avenue, in Richmond. Mr. Roberts was born March 29, 1932, in Taylorsville, NC. He was a graduate of Hampden-Sydney College and the T.C. Williams School of Law at the University of Richmond. Upon graduation, he joined Tucker, Mays, Moore & Reed. The firm later became Mays & Valentine and then Troutman Sanders, where he was managing partner. 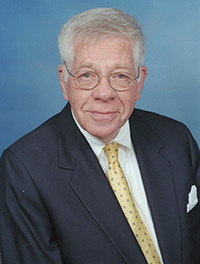 Mr. Roberts was president of the Richmond Bar Association in 1977 and president of the Virginia State Bar in 1980-1981. He was a recipient of the Harry L. Carrico Professionalism Award and the Tradition of Excellence Award from the bar, and the Richmond Bar Association’s Hunter W. Martin Professionalism Award and the Robert R. Merhige Jr. Outstanding Achievement Award. According to the Richmond Times-Dispatch, Roberts was one of the founders of the Central Virginia Legal Aid Society and was a Legal Aid volunteer for many years. He also served on the University of Virginia School of Nursing Advisory Board, Medical College of Virginia Foundation, The University of Virginia Health Foundation, State Fair of Virginia Board, Virginia Military Institute Board, Commission on the Future of Virginia’s Judicial System, Chesapeake Bay Foundation, Westminster Canterbury of Richmond Board, and Virginia Commonwealth University Health System. The Times-Dispatch noted that he is survived by his wife of sixty years, Charlotte Korn Roberts; his three children, Jim Roberts, Cha Roberts and Tricia Roberts Humphreys; his four grandchildren, Christine Roberts, Taylor Roberts, Crawford Humphreys and Artie Humphreys; his sister, Betty Ann Wadsworth; his daughter-in-law and sons-in-law, Debby Krenek, Kelly Kinsey and Tom Humphreys; his sisters-in-law and brother-in-law and his countless beloved nieces, nephews and extended family.